Hi, Today we know, How to get read or write permission in Android phone by this article. I try to make this guide very easy and simple to get easily read or write permission of your Android phone. It is necessary to change on Android system folders. Every change required to read or write permission in Android. Android is outstanding OS, you can easily modify it like change boot animation, Touch, camera and lock sound and change your camera app and keyboard, etc. But for these changes you must have read or write permission of your Android phone root folder. Step 1. Open Root Explorer app. You will see Root and storage if you tap on root, then you will see the left side under the root “Mounted as r/o and just near of it you will mount R/W button. When you open a root explorer app, this set by default on “Mount R/W” but in this condition you have only read permission. See in the image. Step 2. When you tap on “Mount R/W” button, you will see a popup tab from Su app. 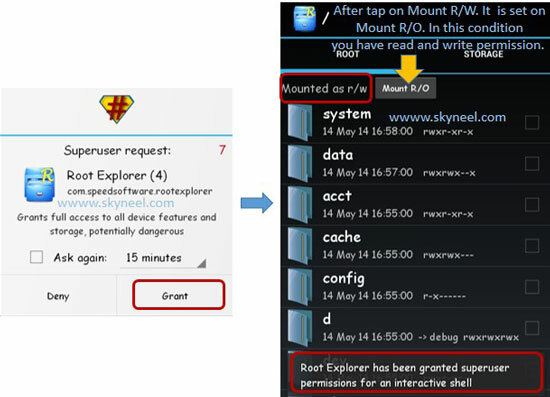 Tap on “Grant” and give permission to Root explorer for access root folder. Now you will “Mount as r/o” changed into “Mount as r/w” and “Mount R/W” button changed into “Mount R/o” button. In this condition you have read and write permission to root folder of the Android phone . See in the image. So change your phone permission and customize your Android phone according to you, but after use, it must be set to readonly for safe and secure your phone. I hope you like this read or write permission on Android guide from which you will be able to easily get read or write permission on your Android Smartphone without any extra efforts. If feel any problem in this guide then please use comment box. Thanks to all. You can read these files, because your phone is not rooted. So you can’t write any thing. Sir mujhe apne keyboard ki key sond change karni hai..
No balke ap us file ka poora name ogg k sath change kar k wahan paste kar do or original file ko usi jaga rename kar do. For example original file he “night ring.ogg”to aap yihi naam apni file ko de kar wahan paste kar do lekin pehle original file ko koi or naam do phir aapki file rename ho gi. hi sir . can you help me solving write secure settings permission . i rooted my nexus 5 marshmallow . then i installed android id changer . but it’s showing ” this app is showing the write secure settings permission , however i was unable to acquire it . please convert this app into a system app ” . i converted android id changer as system app . but it is still asking like that . please help me solving this . tell me about terminal emulator. Move your app in root/system/app then reboot your phone. Sir kai bar root karne par phone battery backup bohot kam ho jata he esa kiun he? Hi SONA, When you face this issue then clear your phone cache and delvik cache.